Technology in the Law Office is a thorough and up-to-date guide to navigating the constantly changing technology used in the modern-day legal world. Exploring recent phenomenon such as the switch to Apple-based software and paperless offices, this text is the timeliest reference for students, paralegals, and law office workers in regards to law software and technology. Thoroughly updated for this edition, the Goldman Technology Resources Website features links to vendor soft downloads, tutorials, and instructional videos. Students are also provided with a solid background in the ethics and implications of using technology in legal practice, allowing them to not only understand how to use such technology, but how to use it correctly and justly. 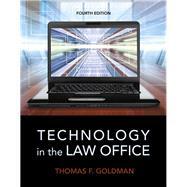 This edition is also available with a CourseConnect Online Course for Technology in the Law Office. The CourseConnect Online Course now includes Virtual Law Office Experience modules. The modules place the student in the position of working in a law office, allowing them to put technology into practice. Students, if interested in purchasing this title with the CourseConnect Online Course, ask your instructor for the correct package ISBN. Instructors, contact your Pearson representative for more information. THOMAS F. GOLDMAN, JD, is Professor Emeritus of Bucks County Community College, where he was a Professor of Law and Management and Director of the Center for Legal Studies and the Paralegal Studies Program. A former member of the Paralegal Studies Advisory Board and mentor at Thomas Edison State College, where he developed the Advanced Litigation Support and Technology Certificate Program in the School of Professional Studies. A founding advisory board member of the American University of Phnom Phen, he created the legal studies curriculm. He is an author of textbooks in paralegal studies and technology, including The Paralegal Professional, Fourth Edition; Accounting and Taxation for Paralegals; Civil Litigation: Process and Procedures, Third Edition; SmartDraw: A Hands-On Tutorial and Guide; Litigation Practice: E-Discovery and Technology; and AbacusLaw: A Hands-On Tutorial and Guide. An accounting and economics graduate of Boston University and of Temple University School of Law, Professor Goldman has an active international law, technology law, and litigation practice. He has worked extensively with paralegals and received the award of the Legal Support Staff Guild. He was elected the Legal Secretaries Association Boss of the Year for his contribution to cooperative education by encouraging the use of paralegals and legal assistants in law offices. He also received the Bucks County Community College Alumni Association Professional Achievement Award. He has been an educational consultant on technology to educational institutions and major corporations and a frequent speaker and lecturer on educational, legal, and technology issues.